Properties in Ranger average 4.6 out of 5 stars. Property 4: Modern dog-friendly cabin! Great views, private hot tub, shared pools! Property 5: Amazing cabin with loft, new decks with hot tub overlooking Carters Lake! Property 7: Privacy with incredible views, short drive from ATL. Perfect for large groups! Talking Rock Creek Resort home with gorgeous views and a shared pool! Property 8: Talking Rock Creek Resort home with gorgeous views and a shared pool! Property 13: Make beautiful memories and enjoy the nature all around you! The American Dream! Property 16: Riverfront A-frame cabin w/hot tub. Float back to your cabin! Property 18: Shady River Retreat -- Your Riverside Paradise! Property 21: Secluded country cabin w/ resort amenities like a shared pool, tennis, more! 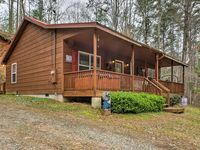 Property 23: Secluded & Luxury Ellijay Cabin w/ Hot Tub & Deck! Property 24: Dog-friendly Coosawattee River Resort cabin with deck, hammock, & shared pools! Property 25: Peaceful Private Cabin, Hot Tub, Fire Place & Dogs Welcome! Property 28: Riverfront pet friendly very private cabin sleeps 10 with hot tub and fire pit! Property 30: Luxury River Front Cabin Hot Tub, Large Game Room, Fire Pit by the River, WiFi. STUNNING CHALET - MOUNTAINS AND LAKE VIEWS! Property 31: STUNNING CHALET - MOUNTAINS AND LAKE VIEWS! Property 34: River View From 4 decks/2 Game Rooms/Hot tub/Privacy/Pet Friendly/Kids Paradise! Property 37: Pay for 2 nights, get 1 free! 3/2 DEER Galore! Property 40: Riverfront! Wi-Fi, Hot tub, Gameroom! 7th Night FREE! 5 STARS!! Lakeside Majesty - Luxurious, Romantic, Custom Dream Home with 5 Star Ratings! Property 44: Lakeside Majesty - Luxurious, Romantic, Custom Dream Home with 5 Star Ratings! 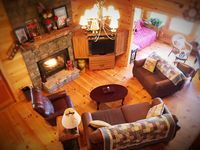 Property 45: Cozy Blue Ridge Mountains cabin w/ private hot tub & wood-burning fireplace! Property 50: Luxury cabin, tranquil, secluded, just minutes from town! WIFI Stone Fire Pit! !